Friends and fellow activists have paid tribute to the anti-euthanasia and disability rights campaigner Dr Kevin Fitzpatrick, whose life and death “epitomised the true meaning of dignity”. Fitzpatrick – who died on 15 January, leaving a wife, Fabienne, and three adopted children – played a huge part in the ongoing campaign to oppose the legalisation of assisted suicide in the UK, Ireland and internationally. But he also led the Disability Rights Commission’s (DRC) work in Wales throughout its seven-year existence, following an earlier academic career in which he taught philosophy, and was a former chair of Disability Wales. He was awarded an OBE in the 2011 New Year Honours for services to disabled people in Wales, and in an interview with Disability News Service to mark the award, criticised the Equality and Human Rights Commission (EHRC) for failing to build on DRC’s work. 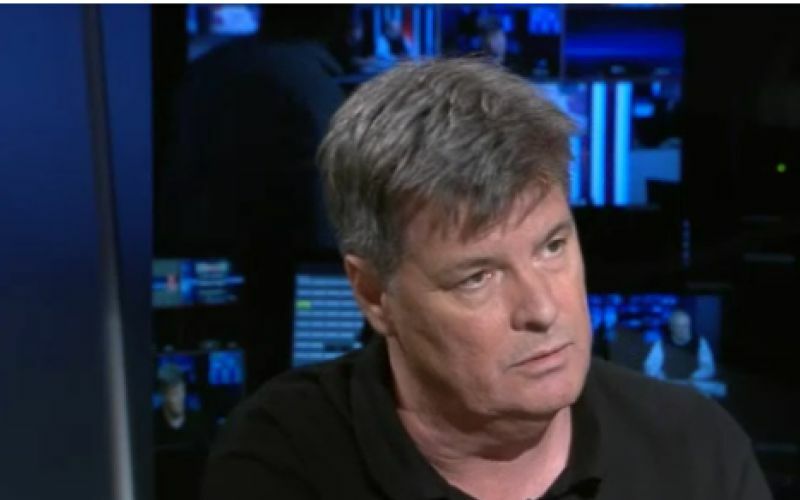 Fitzpatrick (pictured being interviewed by Sky News about assisted suicide) contrasted the EHRC’s work with that of the DRC, which he said was “the best organisation I have ever worked with, in or for”. Among his other roles were as a long-standing chair of trustees of the St David’s Children Society adoption agency – he and his wife adopted three siblings – and chaired the Welsh government’s expert advisory group on adoption. There was also a five-year stint as a board member of Consumer Focus Wales, before it perished in the coalition’s “bonfire of the quangos”, and six years as a director of the Welsh Ambulance Services NHS Trust, despite frustration at its failure to work more closely with service-users. Fitzpatrick – who became disabled in 1973, after being hit by a stray bullet while working in a Belfast shop – also founded his own equality consultancy, Inclusion21, and ran it for nine years. He had set up his own company after seven years as head of policy and research at the disability charity Shaw Trust, leaving the organisation after becoming increasingly disillusioned, and, he would say later, “having learned a great deal more about cynicism and bullying”. Sir Bert Massie, who worked with him at DRC, said he had been appointed as commissioner for Wales but his “careful and precise analysis of issues resulted in his quickly assuming wider responsibilities, taking the UK lead on education and employment issues”. Sir Bert, who chaired the commission, said: “He retained his position throughout the life of the DRC and became highly respected. Lord [Chris] Holmes, disability commissioner at the EHRC, said: “I had the pleasure and great good fortune to work with Kevin as a fellow commissioner at the DRC; his intellect was only matched by his humour and lust for life. “We had many a happy discussion late into the evening with a touch of vino, and in the margins of meetings on philosophy and a bit of politics. Another former DRC colleague, Liz Sayce, chief executive of Disability Rights UK, said Fitzpatrick had “approached every topic with an unusual blend of humour, warmth and intellectual rigour – with great results”. She said: “He was involved in the DRC’s work on employment – for instance, working with small businesses to improve their knowledge and practice; and threw himself into big ethical debates on how disabled people’s lives were valued – or not – by things ranging from the abortion law permitting later abortions when the prospective baby is expected to have an impairment, to ‘do not resuscitate’ notices being placed in the notes of some disabled people without proper consent. In recent years, it was in his role as one of the leading UK campaigners against the legalisation of assisted suicide that Fitzpatrick was best known. In 2010, he took over the policy and outreach work for Not Dead Yet UK (NDY UK) – the network of disabled activists dedicated to fighting legalisation – from Baroness [Jane] Campbell, who had founded the network eight years previously. The disabled peer, who was another fellow DRC commissioner, said he would be “greatly missed” by fellow campaigners, who last September succeeded in persuading parliament to throw out the latest in a series of private members’ bills aimed at legalising assisted suicide. She said he was one of the “greatest advocates” of opposition to legalisation, and praised his “larger-than-life personality, intellectual rigour, vitality, humour and genuine warmth”. He was, she said, a “sad loss to all of us, and the thousands of disabled people’s lives he touched as he fought for our humanity to be valued equally, no matter what our impairment or illness”. Baroness Campbell said Fitzpatrick had thrown himself into NDY UK campaigning work from 2010 with “passion, intellectual drive and selflessness (when he could have been working for a decent income)”. Another leading NDY UK activist, actor and performer Liz Carr, said Fitzpatrick was “a bloody lovely man whose life and death epitomised the true meaning of ‘dignity’”, and was “a man of great integrity”. She also praised his decision to keep his illness private. Fellow NDY UK activist Dennis Queen, who also worked closely with Fitzpatrick, said: “Kevin was a wonderful colleague in Not Dead Yet UK, as well as an inspired and talented teacher to activists who are fighting the creep of euthanasia across the globe. “Kevin was an incredible role model and media representative. I’m not quite sure what we’ll do without him. As well as his work with NDY UK, he worked closely with the Care Not Killing alliance, which described him this week as “a great advocate, campaigner and friend”. Fitzpatrick also founded Hope Ireland, an Irish campaign opposing assisted suicide and euthanasia, and – just two years ago – was the founding coordinator of the Euthanasia Prevention Coalition Europe. One disabled campaigner, Jessica Hatchett, described this week how she met Fitzpatrick when she was a member of Young Voices for Choices, a youth forum for disabled people in Pembrokeshire. She was one of several forum members who were invited to be a part of Rights Into Action 2003, the first international congress of young disabled people, in which Fitzpatrick was heavily involved through his role as DRC’s commissioner for Wales. She said he had been “hugely passionate about the disability rights movement, and spoke very eloquently on the subject”. She said: “He was great at encouraging us to share our thoughts and opinions and getting us to speak up on the issues that we felt were important. She added: “He inspired a lot of us who attended the congress to go after our goals in life. Baroness Campbell said Fitzpatrick had been “very private about his battle with cancer as he didn’t want others to worry about him or let his illness detract from his tireless work to prevent the legalisation of assisted suicide”. She said the disability movement “owe Kevin so much for his commitment, friendship and selflessness because without him our right to be valued as equal citizens, no matter what our impairment or illness, would not have the recognition that it does”. Sir Bert said Fitzpatrick had been such an effective campaigner because “although he dealt with contentious issues he was always courteous even when disagreeing”, and was “always a man of principle”. He said: “He wore his intellect lightly and never sought to intimidate. He always kept a sense of perspective and never lost his gentle humour and interest in other people and their lives.